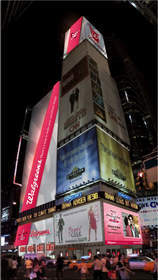 NEW YORK, NY--(Marketwire - February 10, 2010) - The best display of affection -- a kiss -- can't get more public than a Times Square billboard, and Walgreens invites you to "Share a Kiss" with the world for Valentine's Day. The kiss pics will be readily available to share on Facebook, or to print as a photo or gift to commemorate the romantic event. More than 100 personalized photo gift items are available through Walgreens online photo center (www.photo.walgreens.com) and also in Walgreens stores. Walgreens offers a wide range of Valentine's Day essentials including chocolates, perfumes, greeting cards and even gift advisors who can help make holiday shopping easier. Walgreens (www.walgreens.com) is the nation's largest drugstore chain with fiscal 2009 sales of $63 billion. The company operates 7,149 drugstores in all 50 states, the District of Columbia and Puerto Rico. Walgreens provides the most convenient access to consumer goods and services and cost-effective pharmacy, health and wellness services in America through its retail drugstores, Walgreens Health Services division and Walgreens Health and Wellness division. Walgreens Health Services assists pharmacy patients and prescription drug and medical plans through Walgreens Health Initiatives Inc. (a pharmacy benefit manager), Walgreens Mail Service Inc., Walgreens Home Care Inc., Walgreens Specialty Pharmacy LLC and Walgreens Long-Term Care Pharmacy LLC. Walgreens Health and Wellness division includes Take Care Health Systems, the largest and most comprehensive manager of worksite health and wellness centers and in-store clinics, with more than 700 locations throughout the country. Digitas is a leading digital marketing agency, helping the world's biggest brands develop, engage and profit from building profitable relationships with their customers. The Agency pairs media, marketing, technology, creativity, imagination and analytics to ignite emotional bonds between people and brands. Digitas also operates the brand content platform, The Third Act:, the independent healthcare marketing brand, Digitas Health, as well as Prodigious Worldwide, the world's only standalone, global digital productions company. With sister agencies Starcom MediaVest, ZenithOptimedia and Denuo, Digitas is a member of Publicis Groupe's VivaKi -- a global digital knowledge and resource center that leverages the combined scale of the autonomous operations of its members to develop new services, new tools, and new partnerships. Paris-based Publicis Groupe S.A. is the world's fourth largest communications group, the world's second largest media counsel and buying group, and a global leader in digital and healthcare communications. With around the world activities spanning more than 104 countries on five continents, the Groupe employs as many as 44,000 professionals.